Two centuries after their expedition awoke the nation both to the promise and to the disquiet of the vast territory out west, Lewis and Clark still stir the imagination, and their adventure remains one of the most celebrated and studied chapters in American history. This volume explores the legacy of Lewis and Clark's momentous journey and, on the occasion of its bicentennial, considers the impact of their westward expedition on American culture. 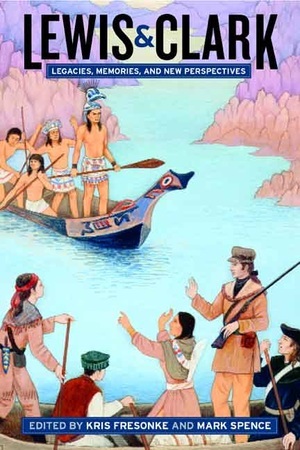 Approaching their subject from many different perspectives—literature, history, women's studies, law, medicine, and environmental history, among others—the authors chart shifting attitudes about the explorers and their journals, together creating a compelling, finely detailed picture of the "interdisciplinary intrigue" that has always surrounded Lewis and Clark's accomplishment. This collection is most remarkable for its insights into ongoing debates over the relationships between settler culture and aboriginal peoples, law and land tenure, manifest destiny and westward expansion, as well as over the character of Sacagawea, the expedition's vision of nature, and the interpretation and preservation of the Lewis and Clark Trail. Kris Fresonke is Assistant Professor of English at Adelphi University and the author of West of Emerson: The Design of Manifest Destiny (California, 2002). Mark Spence is Associate Professor of History and Chair of American Studies at Knox College and author of Dispossessing the Wilderness: Indian Removal and the Making of the National Parks (1999). 4. The Louisiana Purchase and the Lewis & Clark Expedition: A Constitutional Moment?